The shop I teach lessons at runs a challenge every month, and this monthe challenge was ” words”. we were given a sheet of this kaisercraft paper and sent off to create working with the theme words. I came up with two cards, this is the first.Along with the paper ( I can’t remember which collection this one came from – will have to research that) I used all stampin up products – cardstock, seam binding, ruffled ribbon and sentiment stamp.I finished off with a couple of kaisercraft pearls. I was hoping I would be showing my xmas card creations using up my scraps, but due to technical difficulties of the computer sort, Nathan has been busy trying to fix my computer for most of today, so no time left to get the camera out. He seems to have succeeded, and I am grateful cos the alternative was going to have to be spend money on a new one!Til tomorrow…. 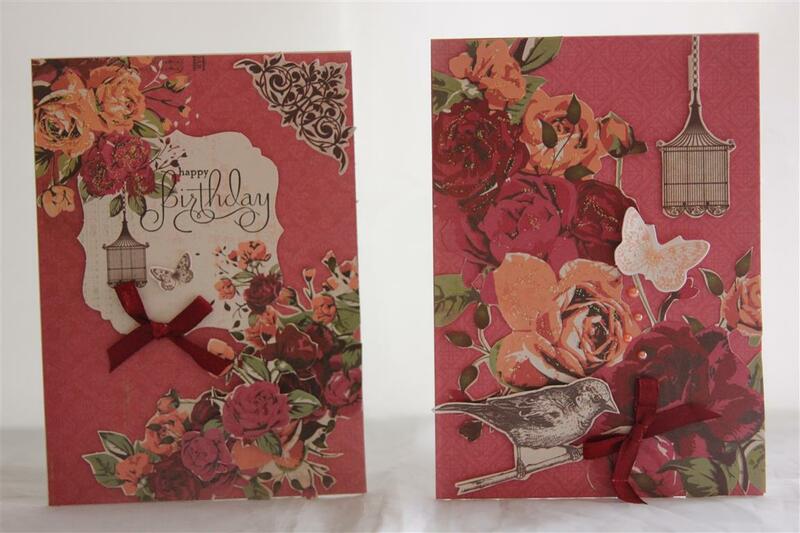 I promise these are the very last kaisercraft lady rose cards I will post! ( well, for now..) I love this colour,but I had a hard time finding ribbon to match which was surprising because I have a huge collection of ribbon. 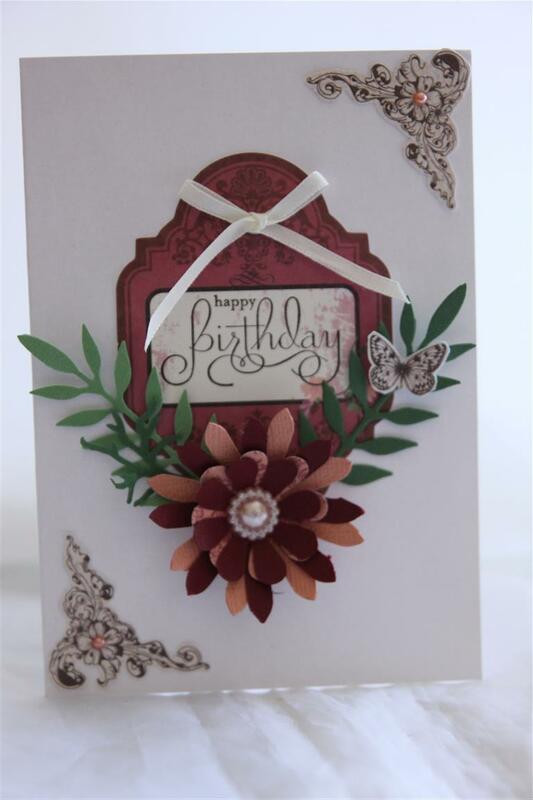 I used the 6″ paper pad and a few of the collectables, and fussy cut some of the paper with the flowers on.quick post tonight as it is Nathans birthday and I have promised him pizza for tea, so its off the the shops for me… til tomorrow…. Today Nathan and I took some photos of the order I completed over the weekend, so for the next week or so that’s what will be showing! I will start with the few cards I made with Kaisercraft lady Rose seeing as that’s what I have been posting up til now – we may as well complete that series, although I still have lots of paper and ideas left – I may well go back to it for Mothers day cards!For both these cards I used the 6″ pad and collectables. 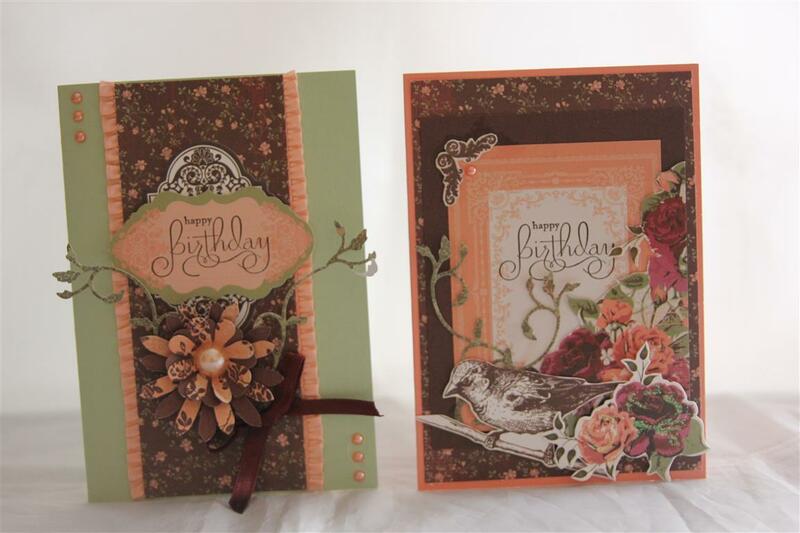 The card on the left also uses stampin up ruffled ribbon,sentiment stamp and blossom party die and on the card on the right I did a bit of fussy cutting using one of the sheets in the paper pad.Today I spent a lovely couple of hours in the craft room making beach themed birthday cards and a couple of bon voyage cards using this months release from kaisercraft. warmed me up a bit – it’s been a wet cool day here today! Til tomorrow…. 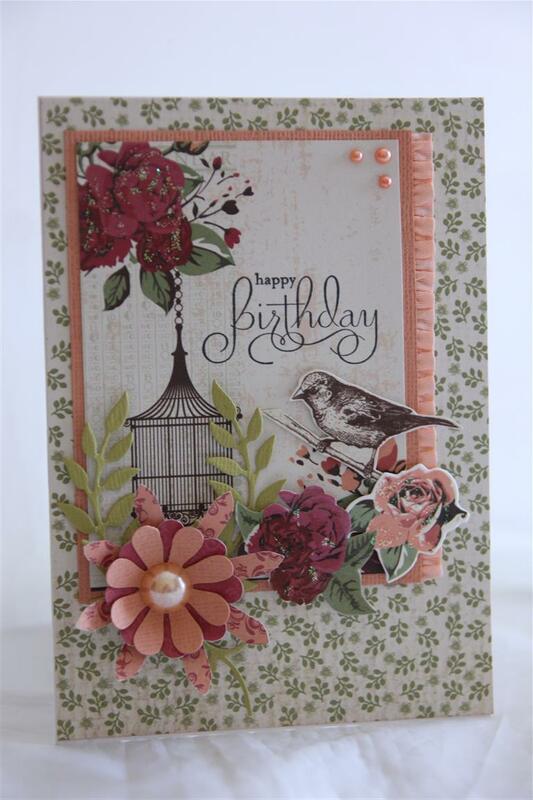 Today I have used just a little of the Lady Rose collection ( just a couple of the collectables, and a label fussy cut from some of the 12 x 12 paper) and left a lot of white space on the card. 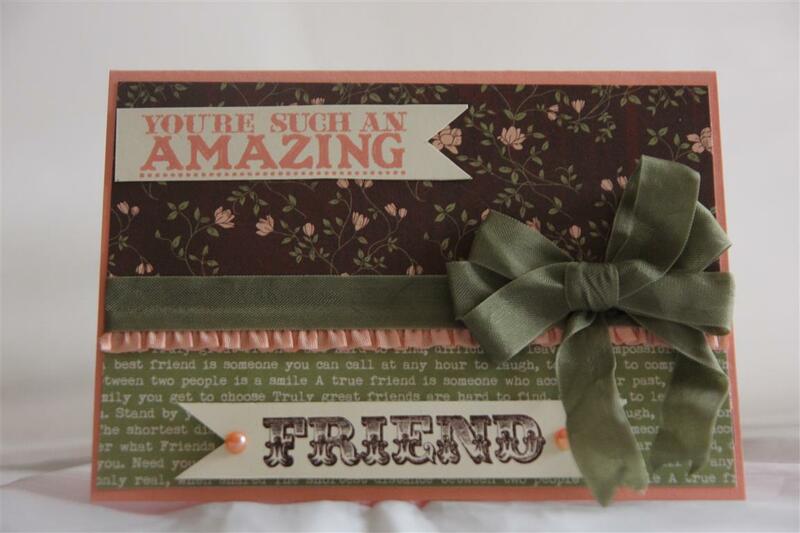 A couple of dies were used – Memory box meadow leaf die and stampin up blossom party die, and then a sentiment stamp, pearls and ribbon to finish. I have a few days off now so I am looking forward to spending some time in the craft room.Thinking of packing up the christmas bits and pieces, so that I can actually work in there!Til tomorrow…. 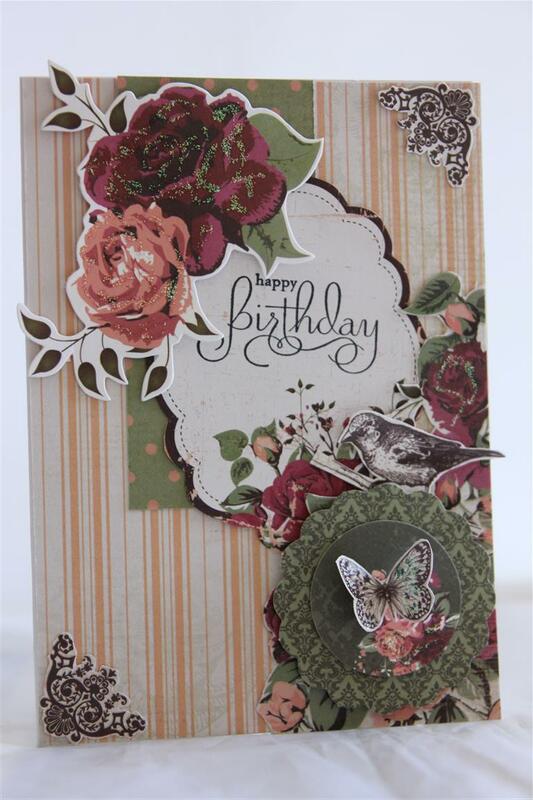 we are back to Kaisercraft Lady Bella papers tonight.. 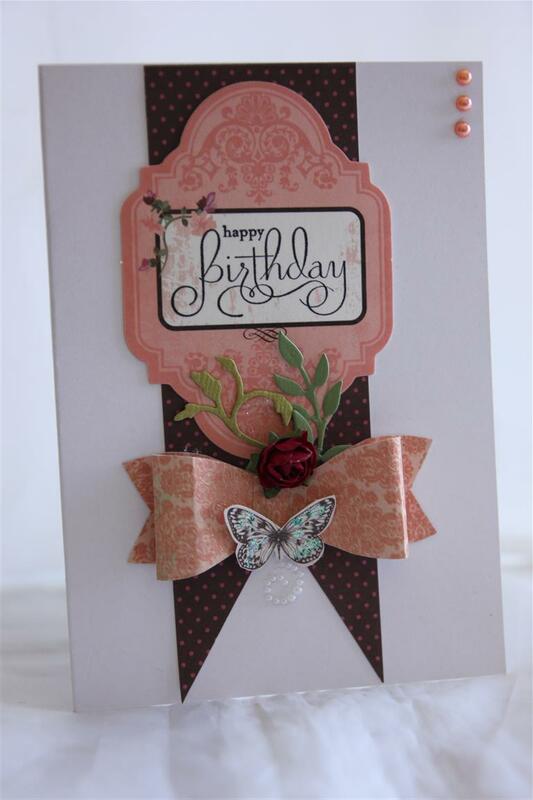 The papers I used here are from the 6″ pad, and the label is from the pack of collectables.I used my stampin up sizzix gift bow die to make the bow, and added some kaisercraft pearls, a mini flower and a little prima pearl swirl under the butterfly.I do love this paper and can’t wait to get back to it, in the meantime I had a bit of a splurge and bought all the new releases from kaisercraft this month, but will have to wait til I can play with them as I have a large order to complete over the weekend. Til tomorrow….